I made my usual turkey for the holidays, but along side I served cinnamon baked apples. I always forget how much I love them, and how easy they are! I got this great idea of using a cinnamon stick for the stem from my friend Stephane at Zen Can Cook. It looked so pretty and the kitchen smelled so good! I also like a sprig of rosemary in each apple to add some color and it is also the only herb that is still alive in my garden! The only tricky part to making these is cutting off the top of each apple to make a lid. Carefully, cut off the top of the apples with a paring knife and remove stems. Hollow out the apples to make enough room for the stuffing, without going all the way thru to the bottom. Mix all the other ingredients together and add the melted butter to combine to make a paste. 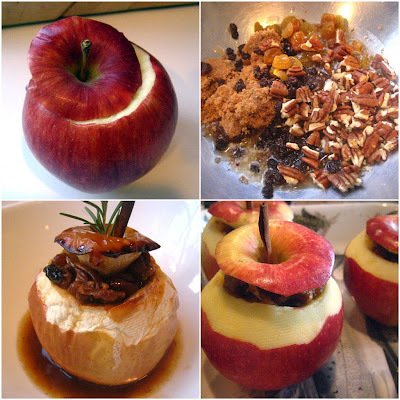 Stuff hollowed out apples with the sugar, raisin, nut mixture and return the lid to the apple. Put a cinnamon stick thru each apple top to hold together like a toothpick! Place apples in roasting pan and pour some orange juice around them. Bake at 350F for about 45 minutes to 1 hour, depending on the size of the apples. Carefully remove from the pan and pour glaze over them in individual bowls. Spear with a fresh rosemary skewer. Serve warm or at room temperature! Beautiful! Those stunning apples would go so well with turkey! did you get a new camera from Santa? Nice pictures! in your dreams. Absolutely mouth watering and beautiful as always. I saw that nice touch of a cinnamon stick on Stephane's blog too, and thought I'd copy that too next time I make baked apples. Except for the rosemary, I make them the same way you do and they're always delicious - and a healthy dessert. Looks wicked good, I love the rosemary in there. Can you taste it or is it just for looks? I love the way the apples look, and I love your bowls! I'm all about fruit right now. Great idea. I'm sure these made your whole house smell wonderful. I'm amazed my rosemary isn't dead yet. I keep hoping my rosemary plants will come back the next year, but they never do. My thyme plant has been coming back for three years now though. I love baked apples! I can't believe that your rosemary has survived. Looks delicious with the cinnamon stick! 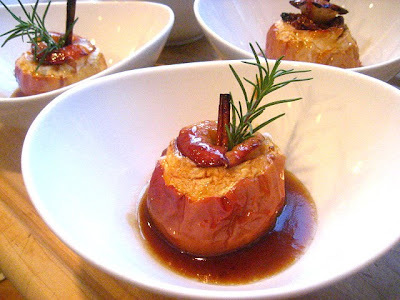 I love baked apples and I'm totally going to do yours - the rosemary... the cinnmon stick...very lovely and festive. What a grand blog! Woa! They look beautiful Stacey and i love the addition of the rosemary stick. Now i'm gonna take that idea from you. I'm glad i could provide a little bit of inspiration here. Merry merry to you!! How beautiful. 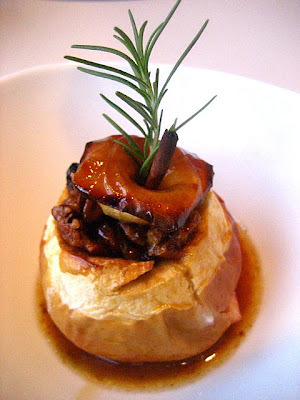 What a great dish to accompany your turkey. Now, this is the way to eat more fruit! I'm so tempted to do this with pears, instead. I favor those over baked apples. Either way, they're beautiful and a true complimentary side dish. Happy Belated Birthday! I've been offline for a couple of days. I love love baked apples. These look delicious! My mom used to always make baked apples for dessert. I found them so disappointing - an apple for dessert?? I love the idea of making them as a side dish. And they are so great looking!